Disha Maru, a 47-year-old resident of south Mumbai, says she is hooked on to Zara: She shops at the Spanish fast fastion brand's store at a luxury mall in Lower Parel at least once a month. "I also shop at Mango, Vero Moda but I prefer Zara for its styles and pricing," Maru says. The store had been abuzz with shoppers such as Maru ahead of the brand's day of discounted sale on January 2. On the day of the sale, there were serpentine queues of customers at the billing counters. Devangshu Dutta, chief executive of retail consultant Third Eyesight, says that even before Zara launched its first store in 2010 in India, the web traffic from India was one of its highest in the world. "It is highly possible that Zara shoppers buy once in five-six weeks, if not once in two weeks as they do in western markets. Most of the other brands would be lucky if they got the same shopper once in two months," Dutta adds. Real estate industry sources say Zara follows a revenue-sharing model with malls rather than fixed rent. "We have seen developers bending backwards to accommodate the brand. It acts as a status symbol and crowd-puller for them," says a top realty consultant who did not wish to be quoted. Inditex, the brand's parent, did not respond to an email. Zara in India and the joint venture between Inditex and Tata-run Trent, has made profits in the second year of operations and has been profitable since then. For the financial year 2013, Inditex Trent made net profits of Rs 45.19 crore on sales of Rs 411.19 crore. The Italian brand Benetton, on the other hand, which has been in India for close to a decade, posted a much smaller net profit of Rs 4.73 crore on higher sales of Rs 521.27 crore in 2012-13. "I do not think there is any brand which has been this successful as quickly besides Zara. Levis, Benetton could be some of the biggest brands but they took long time to get there," Dutta says. Zara has 13 stores in Mumbai, Delhi and Bangalore, including those in Phoenix Mills malls in Pune, Chennai and Bangalore besides Mumbai. Globally, it has 1,808 stores in 86 countries. 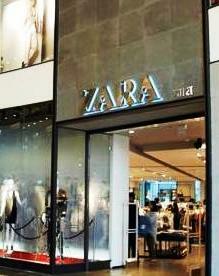 In terms of per square-foot (sq-ft) sales, Zara is clocking the highest in the industry,say retail industry sources. While leading departmental stores such as Shoppers Stop or Pantaloons record sales per sq-ft of around Rs 8,000-9,000, Zara, with stores measuring 15,000 to 20,000 sq-ft, has sales of Rs 50,000 per sq-ft.
Says Rajendra Kalkar, senior centre director, west region, for Phoenix Mills, a Mumbai developer: "Zara is a trendy brand and retails collections of affordable clothes. It should create a flutter in the country." At the company's Palladium mall,where 2 million customers walk in every month, Zara alone draws in a crowd of over 100,000. Experts say that the brand's choice of locations has played a key role in ensuring footfalls convert to sales. The biggest draw for Zara's clientele is its frequent refreshing of merchandise. Zara is believed to bring in a fresh collection once every fortnight in India, relegating older products to sale-time - either at marked-down prices or for end-of-season. In Europe, it updates its merchandise twice a week. In comparison, most fashion brands, both international and national, follow a season-based approach to bringing in new merchandise. Zara has also tweaked its pricing. An affordable high-street brand worldwide, it has had a premium positioning in India. But today, it retails products in lower, mid and premium categories in womenswear, rather than just mid to premium as it did a couple of years ago. Its prices are at least 20 per cent lower than its main competition Mango and Vero Moda in some categories, say consultants. But Zara will have to work to maintain its dream run, now that many international brands are set to enter India. Says Kalkar of Phoenix Mills, "Today it does not have direct competition. When Gap and H&M enter India, there will be real competition." Some say the business model will be in trouble if customers do not change their wardrobe frequently, owing to the slowdown that has also spurred preference for discounted merchandise. "Zara's business model is built on the premise that customers will look for newness," reminds Third Eyesight's Dutta. Dutta adds that when customers look for the best deal, it does not matter whether the products are fresh or not.